The WKD28351GB is perfect if you’re looking for a high-performance washer dryer. Bosch has designed this fantastic model to be user-friendly, with easy-to-use controls and a large LED display. This Bosch washer dryer is ideal for busy families, and can get through up to 4 kg of dirty laundry without a worry. Set an automatic wash and dry programme, and drying will start automatically after the wash cycle has finished. With the time delay function (up to 24 hours), you can set the cycle to end when you get home, so your clean laundry won’t be sitting in the drum all day. This feature is also ideal for the energy conscious, as you can set the appliance to run when energy tariffs are cheaper. Why not take the trouble out of preparing clothes for the week ahead? The WKD28351GB has a useful easy iron function, so take advantage of this, and you won’t have to battle those tougher creases. The large LED display also shows you the remaining cycle time, which removes the guesswork when it comes to unloading. Use the display to look at other features too, such as the programme temperature, spin speed and drying level indication. You’ll find a selection of 14 programmes to suit your load on the Bosch WKD28351GB. There are programmes for cleaning cotton and delicate items, and they vary in temperature, depending on your needs. There’s also a mixed load programme that allows you to combine different fabrics to make a full load. You can choose any of these programmes on the fully electronic control dial. 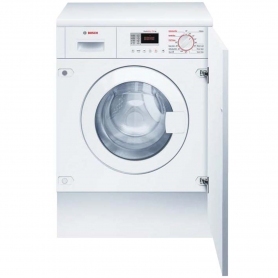 In terms of available space, this Bosch appliance has a washing capacity of 7 kg and a drying capacity of 4 kg. 7 kg provides enough space to wash 35 t-shirts, making the WKD28351GB ideal for medium-sized households. The ‘A’-rated wash performance means you can expect fantastic cleaning results with every wash. 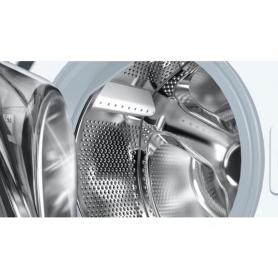 The WKD28351GB also has an effective 1400 rpm spin speed to remove more water from your clothes during the wash cycle. This makes the drying process more efficient and saves you time and money. There’s even a handy buzzer that indicates when the programme has finished. A number of features work in the background of the WKD28351GB, to deliver an efficient, high-quality clean. With the AquaSpa wash system, water enters the drum from three sides for quick and even distribution, including detergent. The specially designed paddles are gentle on your load, and scoop up water during the cycle to bathe your clothes. ActiveWater technology uses sensors to detect the load automatically, and adjusts the wash cycle to prevent wastage without compromising performance. And, the foam detection system adds an extra rinse cycle to the end of the wash, to ensure that all detergent has been removed. The WKD28351GB comes in a classic white finish, and its built-in design will fit seamlessly into your kitchen to create a streamlined look.